Tom Petty ambles into a room like a cowboy who just spent too much time on his horse. He moves slowly, measuring each gesture, mirroring those movements in spare and deliberate speech. Petty's hair isn't combed, his shirttail is untucked and his jeans fit loosely. It's just the rumpled image you'd expect from Petty, one of rock's most low-keyed and steady hit makers. In both his demeanor and music, you'll find his intensity lurking below the surface. Glimpses of it arise as soon as Petty begins discussing the dramatic changes in his life and work that paved the way for his new album -- Echo. The LP arrives amid considerable fanfare. In May, Petty will be featured as VH1's "Artist of the Month"; on May 16, he appears on the network's "Storytellers" series, and in June, he begins his first tour with the Heartbreakers in four years. Yet all this activity surrounds Petty's most personal, revealing and saddest music to date. "I went through a bad time a few years back," says the 46-year-old star, sipping a Coke in his New York hotel room. "I got divorced. It was a really hard thing. I had to put my life back together." He'd been married to Jane Petty for over two decades, a woman he physically resembles. They have two daughters, age 17 and 24. Yet, Petty didn't want to turn this into "the divorce album." "I waited a year before I started writing," he says. "I was still working a lot of the disappointment out. But I didn't want to concentrate on that. I wanted to write about getting on with my life." Which helps explain the album's mix of melancholy and defiance. For all its pain, the LP rocks harder than any Petty platter since 1991's "Into the Great Wide Open." "The defiance is the part of me that's trying to keep from sinking into oblivion," he says. Petty risked sinking further by leaving his work schedule open right after the marital split. He spent an unusual amount of time at his home in Malibu. "I took a year off for the first time since my 20s," he explains. "I was worn out. I had done so much in the five years before. I'd put out so many records and toured 10 months behind 'Wildflowers' (Petty's last formal record in 1994). Also, I thought it wouldn't hurt us to vanish for a while. (But) it was a challenge -- how to fill my days? I reflected on how orderly my life had been. You know every day where you're going to be at 4 o' clock. Suddenly that's gone." During this time, Petty says, "I started writing the album without even realizing I'd written much. I'd sit and write and put stuff on tape but I'd always think, 'That's not really a song.'" His band disagreed. When he took his writing to the Heartbreakers, "they cut the songs so fast," discouraging Petty from any second thoughts. "If I thought too much about what I was writing I would just think, 'Oooo, I'm not going near that.' It's more revealing this way." Especially since Petty wrote nearly every song in the first person, avoiding his common technique of acting as ironic narrator for other people's lives. To stress the album's deeply personal nature, Petty titled a song "This One's for Me." "That's pretty direct, isn't it?" he asked with a laugh. "It's a little embarrassing though. Oh dear." The result brought out a new heaviness in Petty's voice, especially in the opening track, "Room at the Top." The artist says he was trying to ape the plaintive singing style of his friend Carl Wilson (of the Beach Boys), who had just died. "It was my hopeless attempt to sound like Carl," Petty explains. "I'm just pleased that more voices keep showing up because if you've got to sing a whole album it's good to have different sounds on it." Some things remain constant, however. Throughout his career Petty has dealt with the connection between freedom and emptiness, in songs like "Free Falling" and "Into the Great Wide Open." As well as the new "Free Girl Now." He wrote the song for his current girlfriend, whom he met just after the divorce. It addresses sexual harassment. "She had a boss who couldn't keep his hands off her. I had heard about this sort of thing but had never experienced it first-hand. "At first I found it amusing. But as it went on I could see that it wasn't amusing at all. She didn't have the power to fight. I finally said to her, 'You should quit.' One day, she did." Petty has long favored women's stories in his songs, going back to 1976's "American Girl." "Female characters are fascinating to me because as much as they talk they don't necessarily say everything that's on their minds," he explains. "You don't see all the cards, whereas men often throw all theirs down. (Also) my dad wasn't around a lot when I was growing up. I was raised by my grandmother and I had a lot of women around me. So I've always been sympathetic to them. I never saw it in a macho sense. Now I'm proud, when I look back over the last 20 years, that I never did take that stance." That's not the only thing he has to be proud about in his career. 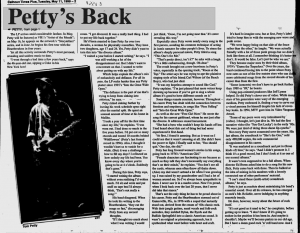 Petty and the Heartbreakers stormed out of Gainesville, Fla., in 1976 with a sound that instantly stood out, derived from the cream of '60s classic rock. With their jangly guitars, nasal vocals and folk-rock melodies, they melded Dylan, the Byrds and Buffalo Springfield into a classic American sound. It wasn't an original or pioneering approach, but it synthesized what went before with heart and craft. It's hard to imagine now, but at first, Petty's label tried to lump him in with the emerging new wave and punk scene. "We were happy being on that side of the fence rather than the other," he laughs. "We were actually friendly with a lot of those punk groups but we didn't look like them at all. I remember thinking it's better we don't. It would be false. Let's just be who we are." They became major stars by their third album 1979's "Damn the Torpedoes." Over the years, the band continued having hits to the point where Petty now rates as one of the few mature stars who can claim more celebrated songs from the second decade of his career than from the first. "Some (concerts) we don't have to go back farther than 1988 or '89," he boasts. Using pop-oriented producers like Jeff Lynne helped. So did Petty's clever use of video. While many stars of his generation were wary of the emerging medium, Petty embraced it, finding a way to carve out a visual persona for himself despite his lack of cover-boy looks. In 1994, MTV gave him its Video Vanguard Award. "Some of my peers were very intimidated by (video). I thought, let's just dive in. We had the first narrative video (for 'You Got Lucky') in the early '80s. We were just tired of doing those damn lip-synchs." Not every Petty move connected over the years. His last album, the soundtrack to "She's the One," sold only 490,000 copies, the sole commercial disappointment in his career. "It was marketed as a soundtrack and put in (those kinds of) bins," he says. "And I didn't promote it. I think it's a good record, but I don't look at it as one of our normal albums." 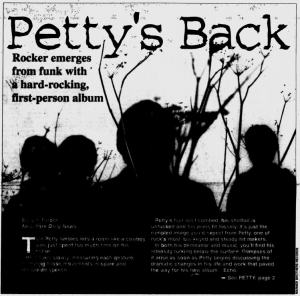 It wasn't even supposed to be a full album, When director Ed Burns asked him to do a song for his new flick, Petty came back with three. Then he balked at the idea of mixing in his numbers with a loosely connected run of other performers' material. "I can't stand those (multi-artist) soundtrack albums," he says. Petty is just as resolute about maintaining his band's essential sound. Over all his releases, he has emerged as rock's Mr. Reliable, never indulging in anything remotely trendy. He does, however, worry about the future of rock itself. "It's not as good as it used to be," he complains, before getting up to leave. "I don't know if it's going to endure in the position it has been in. And maybe it shouldn't. Maybe we'll become purists in our old age. But I have a damn good rock 'n' roll band now. And I want people to hear it."